I have a secret obsession with farming. I have no delusions that I could actual be a farmer -I keep a small garden in the summer months, but I’m not a morning person, and prefer to keep my fingernails clean. However, I love to read tales of those who decide to take the plunge and live off the land. 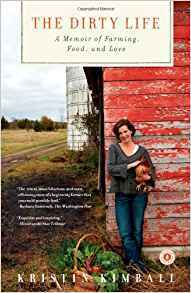 My latest foray into the realm of the modern homesteader was The Dirty Life: A Memoir of Farming, Food, and Love by Kristin Kimball. A New York City journalist, Kimball heads to rural Pennsylvania to interview an organic farmer about food trends. Despite her big-city lifestyle, she falls in love with the farmer and his dream of community-supported agriculture. Soon she’s traded her studio apartment in the East Village for a ramshackle house upstate, sans electricity, while she and the farmer search for land upon which to build his bucolic vision. She ditches 90% of her belongings, begins raising chickens, and gets engaged on a mountaintop. And that’s Chapter 1. The rest of the book spans the first year of Kimball’s life with the farmer, as they find their land and begin the process of creating a self-sustaining farm, planning their wedding, and convincing their new community of the value of local, organic food. It’s full of the pastoral details I adore in print (but would run from screaming in real life I’m sure! ): misbehaving roosters, tomato plants as tall as trees, Amish auctions, and a runaway team of horses. Kimball’s training as a journalist serves her well; I could smell the dirt and the vegetation and the life on the farm. As a good book should, it made me sad when I reached the last pages, but I’ll tuck it onto my bookshelf, knowing that I can visit the farm any time I want. Kimball, Kristen. The Dirty Life: a Memoir of Farming, Food, and Love. New York: Scribner, 2010.